Looking for a bus in Arlington Heights? Chicago Charter Bus Company has access to hundreds of buses to take you to Arlington Park, Metropolis Performing Arts Center, and more. Living in the ‘burbs isn’t bad when you’ve got such a beautiful village to call home. Just 25 minutes outside of Chicago, this neighborhood is the perfect distance away from bustling urban life, giving you the best of both worlds. 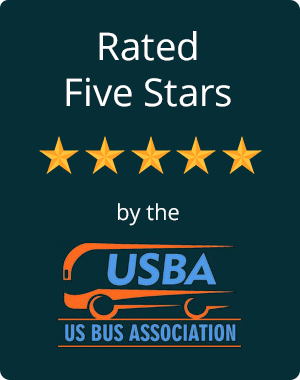 What makes your living situation even sweeter is the fact that Chicago Bus Company services the Arlington Heights area, meaning you can rent a professional chauffeur for all your small, medium, and large group travel needs any time you need to travel into the city or somewhere farther. When people think “charter buses,” some common needs might seem obvious. Sure, large football teams and school field trips will require charter bus services. But did you know we also rent out stunning wedding shuttles, business travel airport shuttles, and customizable chauffeured vehicles for many other occasions? Instead of carpooling to the concert, just call and ask us for a quote on an 18-passenger minibus—chances are, the group will prefer riding together in one easy vehicle, and nobody has to worry about driving under the influence of alcohol. Everyone wins, and your experience will be much more memorable! Wondering how much it might cost you to rent a bus through our network? We provide an accurate rundown of average prices, but keep in mind the price can go up or down depending on your desired amenities. Speaking of which, you might want to know that you can basically add any of the available upgrades to the bus of your choice. Such available upgrades include luxury perks like free WiFi, premium reclining seats, TV monitors, personal AC controls, and more. When you ride with Chicago Charter Bus Company, you ride in style. As you roll through the streets of Chi Town, you’ll feel like royalty in the sleek vehicles we charter. Not only are these rides handsome, but they’re reliable, too. When you need to get to the Cubs game on time, arrange for us to come pick you up in Arlington Heights. You’ll never want to drive yourself to another sporting event again when you experience the Chicago Charter Bus Company way. For more information on the minibus and bus rental services we provide, and which occasions we specialize in, visit our services page. Even if you’re just in the pre-planning stages, we are happy to give you a fast rental quote so you can have a number to work with. There is no obligation to book once you’ve received a quote—we just want to make the process as simple as possible for you. Give us a call today at 312-667-0906 (we’re here 24/7) to speak with a booking specialist about your Arlington Heights group travel needs. Need transport to another of Chicago's many neighborhoods? With buses in Elgin, Glencoe, Naperville, Skokie, and more, we've always got your Chicago-area travel needs covered.